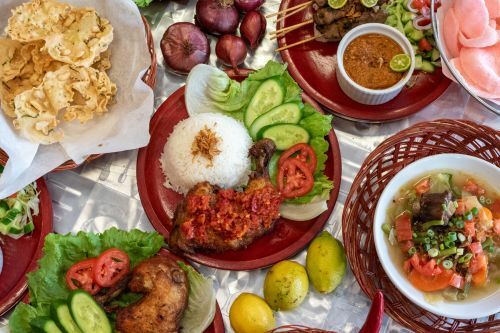 Menulog delivers for Indo Cafe so you'll be able to track your courier on a map. 1 x Nasi Kuning, 1 x Sate Ayam, 1x Nasi Goreng Chicken, 1 x Rendang and 1 x Ikan Balado. BBQ chicken with lemon grass. Fried chicken, salad and chilli sauce. BBQ chicken with green chillies. 3 pieces of beef spleen in curry. BBQ ribs, salad and chilli sauce. Authentic thin sliced beef, chilli and salad. Beef skewers with padang sauce. Fried rice with fried egg and vege, with chicken, beef, or prawn. Turmeric rice with chicken, egg balado, and fried beef. Rice with chicken, salted fish, fried tofu, tempeh, sambal, and sweet and sour soup. Rice with fried duck, tempeh, tofu, salad, and fresh belacan chilli sauce. Grilled chicken,cassava curry, egg balado and rendang. Chicken and meatball noodle soup. Indonesian beef black soup. With rice. Beef coconut soup with fresh tomato, shallots, and buttle nut cracker. With rice. BBQ oxtail soup and buttle nut cracker. with rice. Yellow chicken soup with vermicelli, boiled egg and bean sprout. With rice. Ox tail soup. With rice. Padang specialty sauce. With rice. Steamed veges with peanut sauce. Steamed veges and fruits with peanut sauce. Fish dumpling and veges with peanut sauce. Fried fish dumpling with peanut sauce. Fried Noodle with egg and vege. Palm sugar concoction with green jellies. A variety of fruit in a sweet milk punch.